I made the first set of signs that I will be putting up in the area. They aren't much to look at but I think that they will do the job. I made 6 so far, and yes I know there are only 5 in the picture ;-). Now I just need to get the mailing list tool and legislative contact forms up! 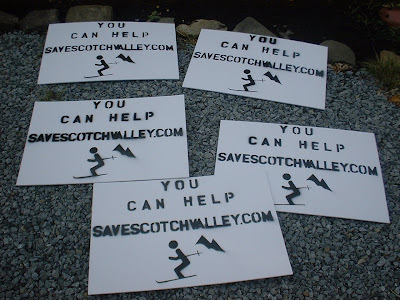 I made a Save Scotch Valley poster that I and anyone can post -- but please hold off until I have the mailing list sign up and the participate page (including legislative contact forms) up. I don't want people coming here and not finding anything they can do -- so please wait until I give the green light. I will let everyone know here when it is time. Hopefully within a day or two. 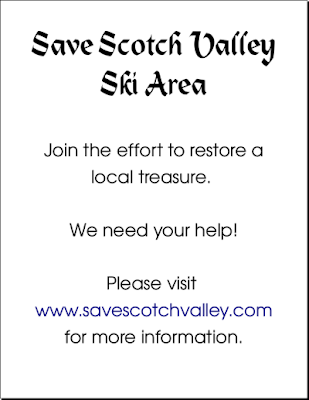 I created a "Save Scotch Valley Ski Area" group in Facebook. Please join it if you are interested in helping this cause! Well I have finally done it, the small thing I can do to restore something that was a great benefit to my community. That is what this Web site is, or rather will be. A motivating source for residents of Schoharie and Delaware counties, and other people who want to see Scotch Valley re-opened. 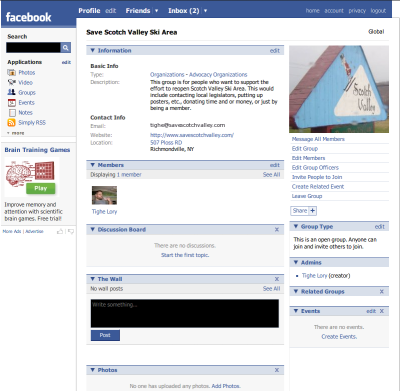 Scotch Valley gave me a lot of good times, great friends and a job for many years, it is the least I can do for it. Where will this go? will it succeed? That all depends on you! I cannot do this myself.